SWEET MYRTLE (Myrtus communis): “Instead of the thorn shall come up the fir tree, and instead of the brier shall come up the myrtle tree.” Isaiah 55:13. Sweet Myrtle is the symbol of divine generosity. According to one interpretation, when “Adam was expelled from Paradise he was allowed to take with him wheat, chief of foods; the date, chief of fruits; and the myrtle, chief of scented flowers.” The bark and roots are used to tan the finest Turkish and Russian leather to which they impart a delicate scent. This scent is used in perfumes, soaps and potpourris and can be enjoyed in your garden too. Our Sweet Myrtle is the dwarf variety. It is useful in gardens that are zone 8 and up as a fragrant hedge or accent specimen. The plant prefers full sun and adequate moisture with good drainage. We recently had the occasion to see firsthand just how important enough water is to this plant. Planted over 20 years ago with Rockroses and Rosemary, this particular lone Dwarf Sweet Myrtle struggled for years on the meager moisture we allowed the rest of the garden. When we redesigned the garden this year, removing the Rockroses and the Rosemary, the Myrtle started receiving moisture almost daily. And over about a three-month period, it grew at least a foot in diameter and more in height. The fragrance also became more pronounced. It is now a very happy 5-foot by 4-foot shrub, covered in its fall purple berries. And, speaking of berries, be sure to pick a few to use for some culinary experimenting. The leaves, flowers and berries are edible but are very strong and should be used sparingly until you are familiar with how they flavor your food. 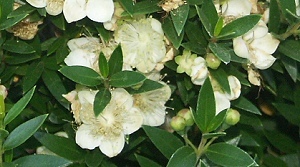 Historically, Myrtle has been used mainly to flavor strong meats, like lamb. Often the leaves are used more like a Bay leaf, removed from the dish after seasoning, instead of becoming part of the dish. The fresh berries have an almost sweet quality that the astringent leaves do not possess. 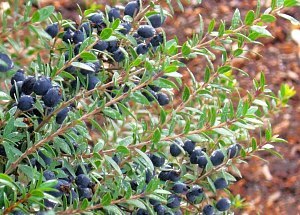 In Sardinia, the liqueur Mirto is a made from both the berries and the leaves of Myrtus communis. A red Mirto is made from the berries alone and a white Mirto is made from the berries and the leaves. This wine is consumed after dinner to aid in digestion. This ancient tradition goes back to about 50 A.D. when the ancient Greek physician, Pedanius Dioscorides, used a Myrtle wine for a myriad of ailments including bladder infections. With homemade infusions on the rise, you might like to try your own hand at infusing myrtle berries into a base liquor like vodka. 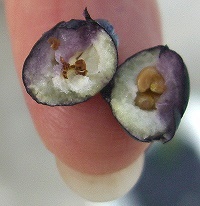 The tiny berries which are pure white on the inside and purple on the outside are reminiscent of tiny grapes. Indeed, their skin color quickly takes over the inner white of the berry and will just as quickly color whatever it comes in contact with. When infused into a clear spirit, the berries impart a delightful deep purple color within a matter of hours. Add a teaspoon or two to your next Martini and make a jewel-colored Myrtini! 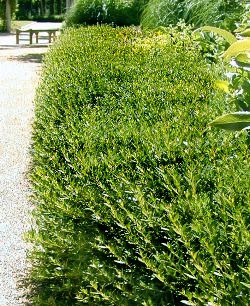 As you can see on the left, Dwarf Sweet Myrtle takes pruning well and is suitable for hedges. It also makes nice topiaries. 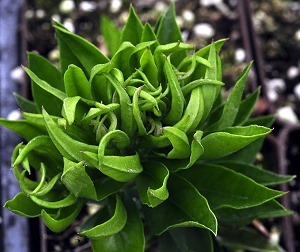 In colder climates, it can be grown in containers and brought in for the winter. Just make sure not to over water it when it is indoors. 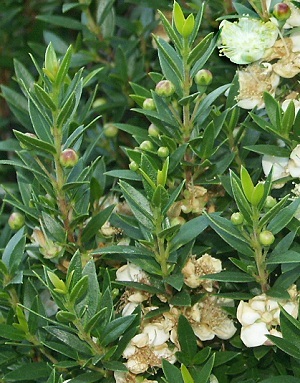 Dwarf Sweet Myrtle is one of the six plants chosen to be in our Biblical Herb Garden Six Pack. Dwarf Sweet Myrtle also makes a great addition to our Zone 8 Fragrant Herb Garden Six Pack. It also makes a good addition to our Edible Flower Garden Six Pack. This plant is often available in plug trays. These trays hold 128 of all the same plant. They are a great low cost way to fill a lot of space. Each cell is 3/4 of inch by an inch. Check here to see if Myrtle Plug Trays are available. 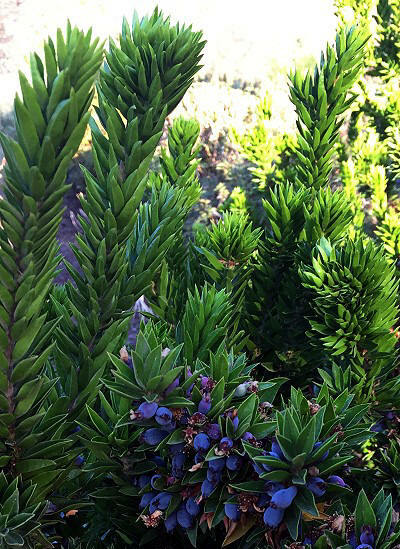 Related to Dwarf Myrtle, Twisted Myrtle is a rare Mediterranean shrub with twisted dark green leaves and stems on a very versatile dense bush. It has very similar growth attributes to Dwarf Myrtle. It grows to about 5 feet if watered well. It also has white flowers followed by dark bluish-purple berries. Twisted Myrtle is very heat and drought tolerant and is often planted in desert climates.